Wray said the indictment of a Canadian national who pleaded guilty on Tuesday to helping Russian spies hack into Yahoo email accounts reflect "one of the more dangerous, emerging threats" facing the United States today, known in the intelligence community as a "blended threat." 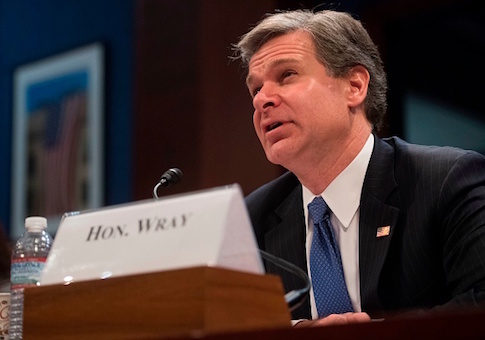 "We are seeing an emergence of that kind of collaboration," Wray testified before the House Homeland Security Committee, noting that until recently governments and criminals worked separately. "Now there's this collusion, if you will, that's occurring on a number of instances … like mercenaries being used to commit cyber attacks." The Justice Department announced charges in March against Karim Baratov, a 22-year-old Canadian citizen, and three other men, including two officers of Russia's Federal Security Service, or FSB, for their involvement in the 2014 hack into Yahoo that affected 500 million accounts. U.S. law enforcement officials said Baratov, who they dubbed a "hacker-for-hire," acknowledged breaking into email accounts and selling the passwords to an agent of the FSB, a Russian intelligence agency. The case confirmed longstanding suspicions that Russia's government hires non-government hackers and uses its spy services to facilitate criminal activity in addition to conducting espionage. To combat the threat, Wray said he has set up a "foreign influence task force" within the bureau made up of different divisions, including counterintelligence, cyber, and criminal investigation. He said the agency would also coordinate closely with the Department of Homeland Security, which is charged with overseeing critical election infrastructure, to prevent against cyberattacks. This entry was posted in National Security and tagged Cyber Security, FBI. Bookmark the permalink.